Showing results for tags 'yugo'. I have for sale one NOS genuine Yugo 59/66 SKS barrel. This is in the white. It's an authentic, brand new Yugo SKS replacement barrel. Country of origin- Yugoslavia Model- SKS Barrel length- 21" Gas Port Drilled- No Barrel Finish- Raw (no finish) Threaded for Receiver- Yes $60.00 SHIPPED CONUS! I accept PayPal and credit cards. Add 3.5% unless paying via "send money to friends and family" discreet method. I also accept POSTAL money orders with no added fee. I have for sale 1 Yugo Mod 59/66 SKS with extras. Includes an ATI Dragunov type stock, folding bipod (mounted on bayo lug), a hard to find California compliant Tapco muzzle brake and a new Promag 20 round removable mag. Bore is bright and shiny. I've fired it maybe a cpl dozen times in the past 10 years I've owned it and it shoots very well. 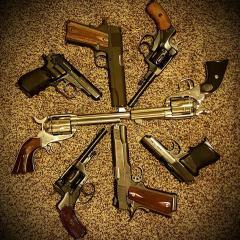 I have too many guns that I hardly ever fire and it's time for some to go. $340 plus $30 shipping CONUS. I will ship this directly to a FFL 03 C&R holder or to the FFL of your choice. Will do FTF in Kokomo, IN. If you want to come get it. PayPal and CC. No fee for "discreet friends and family" payment. Otherwise add 3% DM me for payment instructions. I have for sale one rubber buttpad WITH trapdoor for a Yugo M59/66 SKS. In like new condition. Examples: https://www.buymilsurp.com/recoil-pad-sks-yugo-5966-rifle-p-154.html They want $27.00 + shipping for old crusty rusty ones. Was taken off my unissued Yugo SKS and never used. 2 used screws included free. $26.00 SHIPPED conus. I accept POSTAL MO, PayPal and CC. Add 3% for PayPal and CC. I have for sale 1 Yugoslavian bayonet for the SKS M59/66. It's in excellent, like new condition. Came on my unissued Yugo SKS and was never used. Includes locking collar, tension spring and mounting/ pivot pin. $46.00 SHIPPED conus. I accept POSTAL MO, PayPal and CC. Add 3% for PayPal and CC. I have for sale 1 Yugo 59/66 SKS wooden stock. Decent shape. Includes recoil lug and sling swivel. No buttpad or upper handguard. As pictured. $20 plus actual shipping conus. I accept Postal MO, Paypal and CC. Add 3% for Paypal and CC. I'm looking for a bayonet frog set for a Yugo M70 style bayonet. Looks like the pic. I need both pieces, the handle strap and the frog that clips to the sheath.